All tours to Bamboo Lodge start from Lago Agrio. From there the transport is organized by Bamboo Lodge and included in our tours. 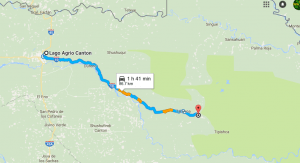 How to get to Lago Agrio? If you are coming from Quito, you can book our private transport which departs from the old town of Quito the night before the tour starts. Departure from: The pick up point is at the Secret Garden Hostel in the old town of Quito. When? At 11 pm the evening before your tour starts (Departure days: Sunday, Monday, Wednesday, Thursday, Friday). Round trip You can also take the private transport from Lago Agrio back to Quito. Departure is at 3 pm from the Airport Lago Agrio and you will get back to Quito around 9.30 pm. Portoviejo, Loja, Tena, Puyo, Ambato, Riobamba, Cuenca, Machala. All buses go to the bus terminal Lago Agrio. From there you can take a taxi ($2) to our office You can get there at any time in the early morning and breakfast is included at 8.30am. The Bamboo Lodge Transport will pick you up at 9.30am to start your tour to Cuyabeno. On the last day of your Amazon tour you get back to terminal Lago Agrio around 2.00 pm. The only direct flight to Lago Agrio departs from Quito, so if you come from another city or country you will have to book a flight to Quito (International Airport Mariscal/Sucre) first. Please make sure you book a flight that arrives in Lago Agrio in the morning (until 10.30am). The Bamboo Lodge transport will pick you up directly from the airport. Please send us your flight details. On the last day of your Tour the Bamboo Lodge Transport can drop you off directly at the Airport Lago Agrio around 2.00 pm. If you come by car you can leave it at our office or dirve directly until the Cuyabeno bridge (2 hours car ride from Lago Agrio) at 11.30am. You can park your car save in both places (Cuyabeno bridge or Bamboo Lodge office). You can also park your car in Lago Agrio and leave with our transport (9.30am). 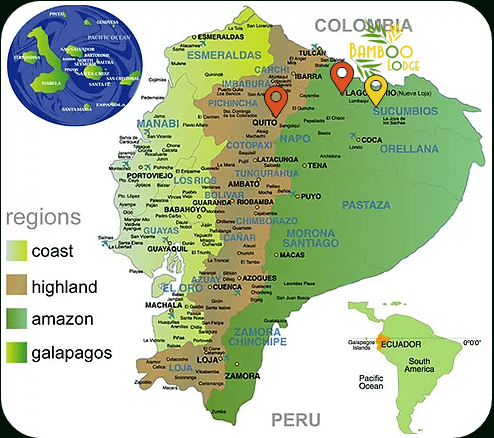 When and where does the amazon tour start and end? Our Amazon Tours always start from Lago Agrio in the morning at 9.30am. If you come by airplane, according to your landing time, we pick you directly from the airport Lago Agrio. Please make sure you book a flight arriving until 10.30am in the morning. If you get to Lago Agrio the day before, we will pick you up directly from the Hotel/Hostel you booked in Lago Agrio. Your tour ends on the last tour day back in Lago Agrio around 2 pm. The Bamboo Lodge Transport can drop you off at the Airport Lago Agrio, the bus terminal or at the meeting point for the private transport back to Quito. What do I need to bring to the amazon tour? Can special diets be accomplished? Of course! Our cook can arrange vegetarian, vegan, gluten-free and diabetic-friendly meals. Please make sure to inform us when booking your trip. Family trips: Can I bring my children? Of course! It’s a great adventure for kids to see the amazon rainforest! Families are very welcome in Bamboo Lodge! If your kids are really young we recommend a private tour, customized for you and your children. Just contact us for more information. Yes, there is. Bamboo Lodge is provided with solar panels and an emergency generator. You can charge your cellphones and cameras during the day and we have light at night until 11 pm. Anyway, solar energy is limited and we try to avoid to turn on the generator, so we appreciate if you help us to save energy. Do you have hot water showers? Is there Internet at the lodge? Do I get a cellphone connection? There is also no cellphone connection. We have a fix phone line at the lodge for emergency calls. Advance payment can be made through Paypal, where you have a credit card option. Upon arrival in Lago Agrio we do not except credit cards, cash payment is required. There are several cash machines in Lago Agrio (of Banco Pichincha, Banco Guayaquil, Banco Internacional), if you want to avoid traveling with cash. What is the group size of the amazon tours? Maximum group size is 10 guests per group. But depending on the season, groups can be much smaller.